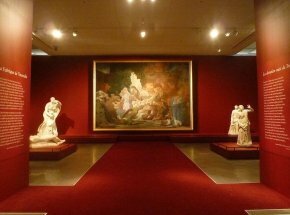 Among the restored paintings hung in the Musée des Beaux-Arts in Angers for its reopening in 2004 (see article in French), there was a large, unfinished canvas by Pierre Guérin, The Death of Priam (ill. 1). Despite its obvious quality and its presence in a public collection since the late 19th century , this masterpiece remains relatively unknown. Thanks to Mehdi Korchane, a specialist on the artist, and also to the Musée d’Angers which is now presenting Guérin in an exhibition (more than a simple special-study exhibition), this bravura piece, unique in his career, should now find a fitting place in art history. In this painting, Guérin attempted, and nearly succeeded, to find an answer to the challenge set down before the Neo-Classical school by Romantic artists, most of whom were in fact his own students. We of course know that we can no longer reduce the art of the second quarter of the 19th century to a simple opposition between the Romantics and the Neo-Classics even though it was very real to those at the time. A painting like The Death of Priam forces us to reflect on this accepted classification. The catalogue is very enlightening on the matter, notably the essay by Philippe Bordes which analyzes the conditions in which certain so-called Neo-Classical artists sacrificed themselves to the "dramatic excess contrary to classical principles". Guérin was indeed not the first to introduce this excess into his paintings. But his painting, though unfinished, is no doubt one of the most beautiful. The museum staging is in great part responsible for the success of the show. It dramatizes the Guérin canvas (ill. 2) in a remarkable way, surrounding it with plaster casts of Niobids which Mehdi Korchane correctly suggests as being one of the painter’s sources of inspiration. The different sections of the exhibition are clearly identified throughout the visit as well as in the catalogue. The aim is to analyze both the sources, the conditions in which the artist created his work but also its legacy, though obviously limited since the painting was almost always invisible or ignored. Although the episode of the fall of Troy does not appear in the Iliad and the oldest texts recounting it have now disappeared, we know it through different sources, notably Virgil, as well as scenes represented on Greek vases. 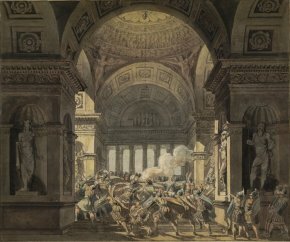 Two of these are on view when entering the exhibition but examples prior to Guérin can be found among his immediate predecessors such as Jean-Louis Desprez (ill. 3) with a beautiful watercolor from the British Museum, also Jean-Louis Le Barbier or Italians such as Canova, Bartolommeo Pinelli and Pietro Benvenuti. 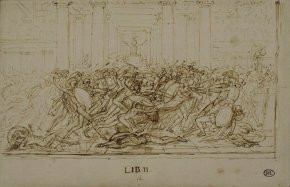 The subject of violent death, whether it be Priam’s or not, was often treated during this period and several examples are presented, for instance by David (several very beautiful drawings including Caracalla Killing his Brother Geta) as well as Gros and Girodet (ill. 4). However, most of these works resort to a frieze composition, characteristic of Neo-Classicism. Romanticism, initiated in 1819 by Géricault and his Radeau de la Méduse, descended upon the Salons of 1824 and especially that of 1827, but Guérin was no longer in France since he had taken over as head of the Académie de France in Rome from 1823 to 1828. Nevertheless, it is unlikely that he did not follow at least indirectly this revolution which he had involuntarily initiated in his classes. 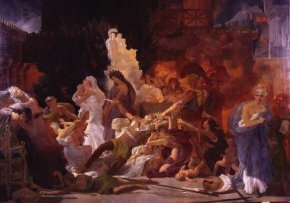 The Death of Priam, which he started in Paris in 1830 and left there unfinished before returning to Rome where he died is without a doubt an attempt to provide a response to the large Romantic works produced by Delacroix, Scheffer or Callande de Champmartin. The entire work comes together to make the dramatic scene unfolding there even more heart gripping. On the left, Hecuba passes out on seeing her family massacred. Her son Polites is lying at her feet while Andromach escapes holding the young Astyanax in her arms and Cassandra, with a horrified look, observes the fulfillment of her direful predictions. In the middle, Pyrrhus pulls an aged Priam backwards by the hair as he prepares to strike him. Finally, on the right, Helen is fleeing, obviously in shock over the consequences of her act. When looking at this canvas, we find it hard to believe that it remained undiscovered for so long without generating more studies and commentaries. Despite its incompleted state, it is truly splendid. The metallic tones of the draperies are in violent opposition to the reds of the flames started by the fire. The atmosphere recalls certain Ossianesque episodes. The canon of the figures as well as their stiffness is antithetical to Romantic art but the painting is infused with an epic air which leaves the viewer deeply impressed. 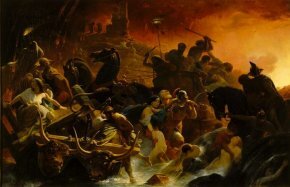 Although it left no real legacy in its wake, we should note that at the very same moment a Russian artist achieved very similar results, though working totally independently, on another subject from Antiquity : Karl Brjullow in fact exhibited in Rome in 1833, then in Milan, The Last Days of Pompey. A short time later, around 1850, the same subject treated by Frédéric Henri Schopin (ill. 5) repeats an identical vein which would eventually lead to the peplum. The exhibition presents these works (or a study by Brjullov). 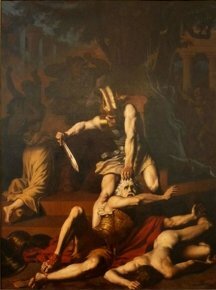 Of special note, there are also several paintings presenting, no doubt independently of Guérin’s, the subject of The Death of Priam, particularly the one by the little-known Alexandre Louis Leloir (ill. 6), a preparatory painting for the Prix de Rome of 1861 where he came in second, as well as a study by Georges Rochegrosse (a painter of uneven quality) for the gigantic painting at the Musée in Rouen. 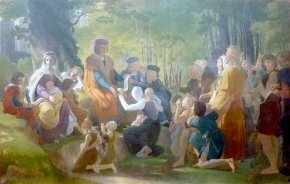 Museums goers can conclude their visit to the Guérin exhibition by entering the galleries to discover another painting by the artist, Saint Louis Meting Justice under the Oak in Vincennes (ill. 7), although of lesser quality. It was originally supposed to decorate the Diana gallery in the Tuileries palace but was also left unfinished. Accidentally damaged in 1905, it had not been presented since that time and was restored for this occasion to replace The Death of Priam on the walls. Different from the purely Neo-Classic scenes such as The Return of Marcus Sextus and more so of course, The Death of Priam, it resembles a large troubadour painting and reflects the artist’s very diverse sources of inspiration. Under the supervision of Mehdi Korchane, La Dernière Nuit de Troie. Histoire et violence autour de La Mort de Priam de Pierre Guérin, Somogy Editions d’Art, 2012, 184 p., 29€. ISBN : 978-2-7572-0536-5. Visitor information : Musée des Beaux-Arts, 14 rue du Musée, 49100 Angers. Tel : +33 (0)2 41 05 38 00. Open from Tuesday to Sunday 10 am to 6 pm. Admission : 6€ (reduced : 5€). It was donated to the Musée des Beaux-Arts in Angers in 1862 by Léon Cogniet, a student of Guérin.